Last night I saw Anonymous, the new movie about Shakespeare. It’s good. I give it a 3-star rating. Set in 16th century London, Anonymous is visually stunning, and worth seeing for that reason alone. I’m an “Oxfordian,” one who believes that Edward de Vere, the 17th Earl of Oxford, wrote under the penname William Shakespeare. A growing number of scholars (including two-time Pulitzer Prize winning historian David McCullough) share that belief. In contrast, “Stratfordians” think the fellow from Stratford-upon-Avon (whose actual name was Will Shakspere, not Shakespeare) was the Bard. The plot of Anonymous seizes upon the authorship question: who was William Shakespeare, the earl of Oxford using a pseudonym, or Will of Stratford-upon-Avon? The film’s director, Roland Emmerich, and its screenwriter, John Orloff, are passionate Oxfordians. Anonymous thus takes one side in the debate, presenting the case for Oxford through a work of historical fiction. I’ve written a 400-page historical novel called The Immortalizer, which is about Shakespeare. I can therefore appreciate the challenges the makers of Anonymous faced in telling Oxford’s story. Anonymous revolves around historical events taking place at the end of Elizabeth I’s reign, incorporating a Shakespeare (Oxford) storyline. Such an approach is an enormous challenge due to the sheer volume of plot elements the story requires. For starters, you’re dealing with at least three major spheres of action, each with its own set of characters: the Queen’s court and noblemen, the Globe theater and writers and players, and the residence of the main character, Oxford, who lives in seclusion. And what is Oxford doing? He’s writing and revising all those famous plays, long poems and Sonnets which reflect his life experiences. Lots of flashbacks are needed. Add in historical events, including the war England was waging in Ireland at the time, the failed rebellion that some of Elizabeth’s courtiers mounted, and the involvement of the Globe’s players in that rebellion, and you have more than just a lot going on. On top of all that, what should be the main event – showing what kind of person Oxford was (which, in short, was incredibly complex) – further complicates the task, making it the equivalent of climbing the Himalayas. Anonymous has roughly two hours to pull it off. It succeeds. At times, however, I felt like someone chugging a can of condensed milk. In particular, it troubled me how so many of the facts about Oxford’s life were distorted in the interest of compressing its richness to a length suitable for mass consumption. For example, at the time depicted in the movie, Oxford wasn’t living with his first wife, Anne Cecil. She was dead. Several of Shakespeare’s plays deal with a man that falsely accuses a spouse, lover or fiancée of infidelity, only to find out he’s wrong after learning she’s dead. Oxford had a similar experience with Anne Cecil. 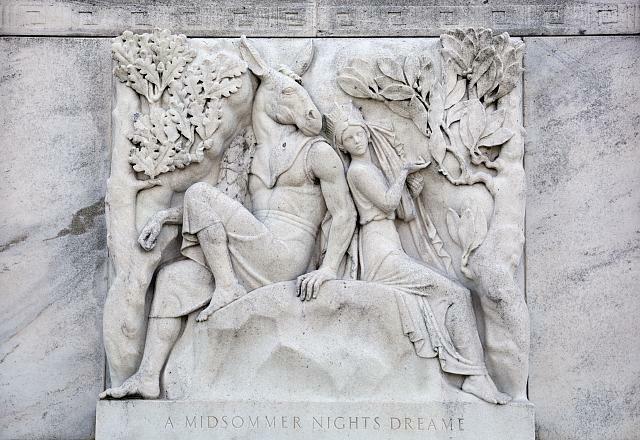 Oxfordians believe that The Winter’s Tale, for instance, is one way Oxford apologized to her. But you won’t see such remorse in Anonymous. Instead, you’ll see Anne portrayed as Oxford’s harping wife who hates him for writing plays. By all accounts Anne Cecil had just the opposite character. Other examples: Oxford was not stabbed in the leg by a fencing instructor hired to kill him, and Oxford did not kill someone standing behind a curtain reading his poems. At a much earlier time than shown in Anonymous, the uncle of a woman whom Oxford got pregnant fought Oxford in a duel, severely wounding him in the leg. Oxfordians believe Romeo and Juliet reflects this family feud. The person Oxford killed was not someone surreptitiously reading his poems, but a drunk cook. Personally, I see no direct connection between that experience and the scene of Polonius’ murder in Hamlet, though Anonymous tries to make one. The Sonnets – the only time we hear Shakespeare talk about himself at length in the first person – in my view are given too little attention in the movie as a source to show Oxford’s thoughts and feelings. Moreover, there are so many major characters and so much going on (at moments I found it confusing), Oxford’s presence takes up perhaps only a quarter of the film’s length, when he should be the main event. One gets the sense the movie is more about Queen Elizabeth than about Oxford-Shakespeare. Minor details? Perhaps. But there are so many liberties Anonymous takes with historical facts (those about the rebellion, for instance, are quite distorted) in order to squeeze everything into two hours, some might argue that the entire movie is bunk. In the end, however, it’s a matter of personal taste – certain people prefer more accuracy in historical fiction than others, and many likely have no problem with an artist that observes wide boundaries in the exercise of his artistic license. One more thing. The name of Will from Stratford-upon-Avon was Shakspere, not Shakespeare. As I’ve said here before (Shakespeare Wrote Shakespeare), many Oxfordians dismiss this point as if it were some minor detail. It’s not, in my opinion. Given the good historical evidence showing why Oxford chose the pseudonym Shakespeare (or Shake-speare), it’s unfortunate that Anonymous just assumes that Will of Stratford’s name was “Shakespeare.” Conceding that point to Stratfordians is like handing one of your chess pieces to your opponent before the match even begins. Anonymous is a good movie and worth seeing. Hopefully, it will encourage individuals to think for themselves in deciding the true identity of William Shakespeare.